2014 was a huge year for me – I moved cities, began university, started blogging, turned eighteen, endured a long-distance relationship, met heaps of new friends and I have matured as a person from the experiences I had this year. This post is more for myself as a permanent reminder of the highs and lows of my first year out of high school, but if you’re reading this – it’s gonna get a bit personal. Late June, 2014 was when I opened my blog and began posting on it. This is really the first blog I have kept up with, and I’m proud of what I have put out this year. As of today, my blog has been viewed 1,386 times – 494 Australian views, 473 US views, 154 Canadian views, 85 UK views and views from nearly everywhere around the world – which I definitely didn’t expect! 273 people were referred to my blog from Search Engines, using terms such as “my first time tag”, “a quiz about me”, “long term long distance relationships”, “popular british youtubers”, “trxye”, “my first semester at the uni”, and my personal favourite: “tyler from pentatonix is he gay” (there is no Tyler in Pentatonix). 136 people were referred through my Twitter (*cough* follow me). More of my traffic came from my Tumblr, my Pinterest pins, WordPress Dashboard, plus a variety of Tumblrs that have reblogged my posts for their followers to see! My most popular post was by far my College Room Homewares post, with 106 views. 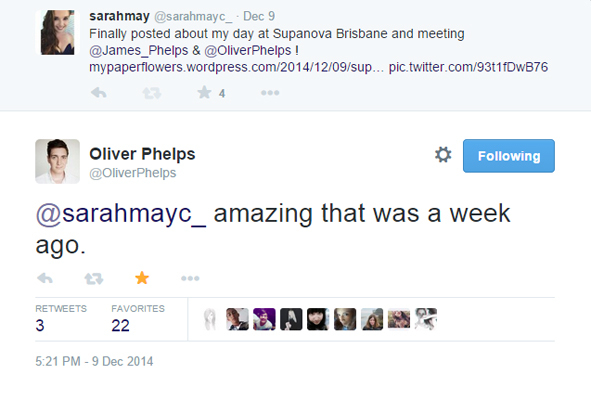 Coming in second was My First Time Tag with 57 views, and then Supanova Brisbane, 2014 with 52 views (thanks to Oliver Phelps for replying to my tweet about it, which drove most of the traffic for that post). My least viewed post was my Update: I Have A New Theme post, with only 5 views. Photos from my posts have been clicked on 13 times, and 10 people have clicked through to YouTube videos or channels that I have linked to in my posts. My Twitter, Tumblr and Instagram have been clicked through to only three times, and my Pinterest only once! My most popular day of 2014 was September 13th with 72 views, predominantly on College Room Homewares. My first year of university was filled with many highs and lows. I endured horrible Chemistry lectures but got to cuddle goats, horses, cows, sheep, rats, mice, cats, dogs, chickens, fish(!!) and pigs. My first semester ended with a GPA of 5.5, with a High Distinction in Biodiversity, a Distinction in Veterinary Professional Life and Credits in Chemistry and Biochemistry. My second semester was a bit more of a struggle – I received a Credit in Veterinary Professional Life 2 and my results were withheld for Anatomy & Physiology because I didn’t pass the Physiology component. Early February is when I have to sit a supplementary exam for Physiology, so my studying isn’t over yet. Despite my results, I had an amazing time experiencing university life and meeting lifelong friends. Tertiary education is definitely much more of a struggle than high school, but I am proud of where I have come so far. 2014 was when I resided at Western Courts, a dodgy run-down college composed of demountable buildings. My room was 1/4th of a demountable building about 1m wide in the bedroom and another 1m wide in the ensuite. This year, I learned how to fend for myself and live alone – I had friends living near me but most of my time was spent studying alone. I gained confidence and independence, especially once I could drive at uni. Next year comes with a new chapter at a new college and I couldn’t be more excited! This year, I met Blair, Tarryn, Jess and Sarah (aka Barry), fellow first year vet students. We all met on our orientation when we were put into the same group, and Blair and I got lost, oops! After semester one, Blair and Sarah drifted away, but my friendship with Tarryn and Jess only grew stronger. I met Priyanka, Nethmee, Hannah and Jane while at college. I met Priyanka as I moved in, as she was moving into her room two doors down at the same time. Days later, we both chose to eat lunch with Nethmee and Hannah, who also lived in our block, who we then became great friends with! We met Jane in semester two when she would sit with us every night at dinner. She lived a few blocks away but we’d all catch up at dinner! When I came home from uni, I always had friends here for me. Our little group consisting of Sam, Imogen, Hayden, Jesse, Brittany, Lachlan, Ben, Daniel, Eka, Katelyn and Stella continued to stick together even though Imogen was overseas in Denmark and Jesse moved to New Zealand. We drifted away from Gideon and Jake, who changed a lot since high school, but the rest of us would have so much fun catching up whenever we could! 2014 began my five-year-long long distance relationship with long term boyfriend Sam. It was hard being apart, but we would iMessage every waking moment of the day and have a weekly Skype night every single Friday night. Whenever I would come home from uni, we would make up for lost time. We went on our very first holiday this year, to Brisbane for Supanova. We both got our licenses and could finally stop relying on parents to drive us to each other. Our relationship has matured and evolved so much, and we are ending the year spending ten days house sitting my aunt’s place. I love spending days and nights with him, and it’s great practice for living together – which will definitely happen after I graduate in 2018! This year marked six years since we lost Dad, and two years since we lost my great-grandmother. This year, my grandma on Dad’s side joined them, and I was unable to attend the funeral due to being up at uni. Late in the year, a close childhood friend of mine who was a few years older than me took her own life, which deeply affected all of us. I’ve still remained very lucky to still have the people in my life that I do, especially my Nana and Pop on mum’s side and all of my aunties, uncles and cousins. Thank you, everyone who was a part of my life this year. Here’s to a better 2015. Make this next year your year! Whatever your resolutions are, keep them if you can, and stay happy! « What I Got For Christmas 2014!